BRANDON, MB – A Brandon University (BU) researcher with an international reputation reconstructing the ancient world from plant fossils is returning to the field this summer thanks to support from the National Geographic Society. Dr. David Greenwood, a Professor of Environmental Science in BU’s Department of Biology, has been awarded US$14,483 by the Society’s Committee for Research and Exploration to cover costs of an expedition to southern British Columbia this summer. 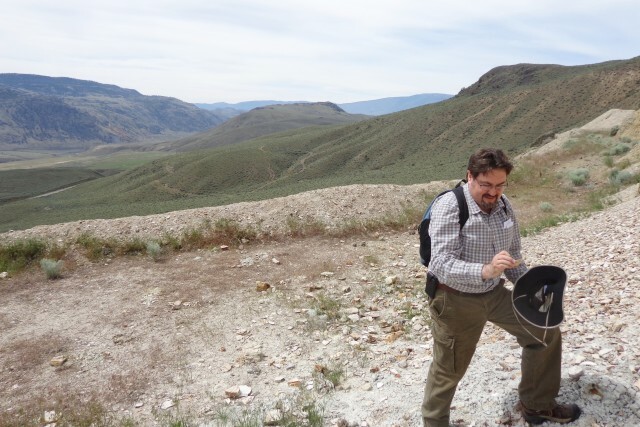 Dr. Greenwood will travel to the McAbee fossil beds near Kamloops, B.C. from July 27 to August 3, and to areas around Princeton, B.C. from August 3 to 7. “We will find fossils,” says Dr. Greenwood, a plant biologist who will be joined by mammal fossil expert Dr. Jaelyn Eberle from the University of Colorado and fossil insect expert Dr. Bruce Archibald from Simon Fraser University. On previous field expeditions within northern B.C. at Driftwood Canyon, Dr. Greenwood and his students discovered fossils of a previously undiscovered tapir relative that was about the size of a large dog, as well as fossils of an ancient hedgehog that would have been smaller than a mouse. Both animals thrived in the lush, sub-tropical environment that spanned Canada during the height of a period of global warming 52 million years ago during the Eocene Epoch. Dr. Greenwood plans to return to Driftwood Canyon this fall. Other sites to be explored on this trip have yielded Eocene Epoch mammal fossils during digs in the 1920s, 1930s and 1960s, but have since been virtually untouched by researchers. The National Geographic Society funds fossil explorers around the world, and Dr. Greenwood’s fieldwork and discoveries in this area may be profiled on their website, www.nationalgeographic.com/explorers.